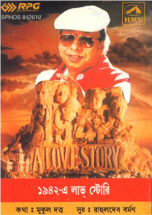 The songs of this film was remade with Bangla lyrics by Mukul Dutta. This album was released after RD passed away. Note : These songs have been included in the list of basic Bengali songs in Nerurkar's book.Since these are remakes of the Hindi originals using the original music tracks, these songs should be treated as remakes, and should not appear in the basic song list.